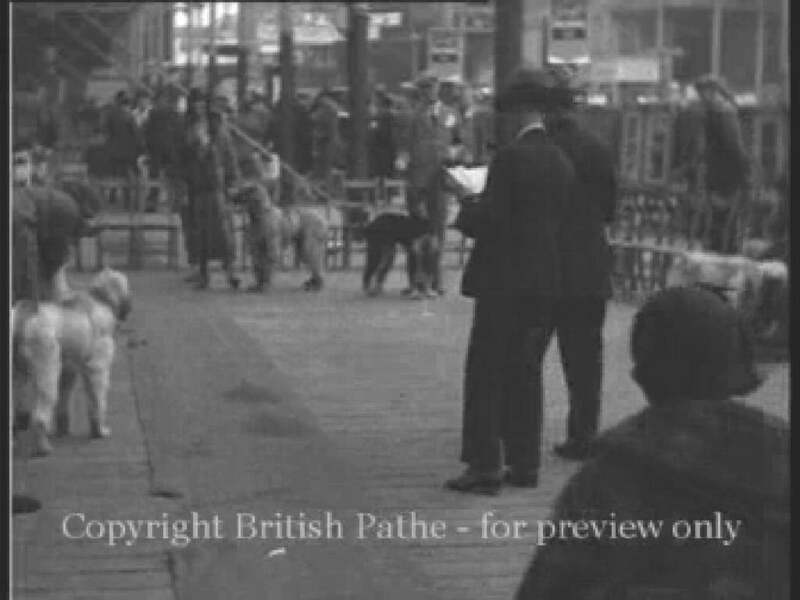 CRYSTAL PALACE, LONDON 1932 from "Fourleggers"
Photo's #3 and #4 are of particular interest to us. 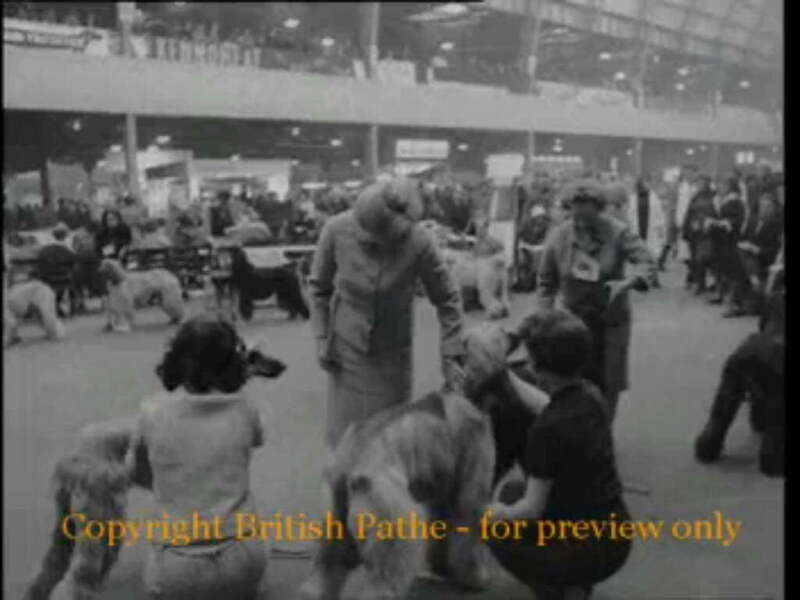 The brindle Afghan hound at the back of the show ring, is, we believe, Ch Badshah of Ainsdart. 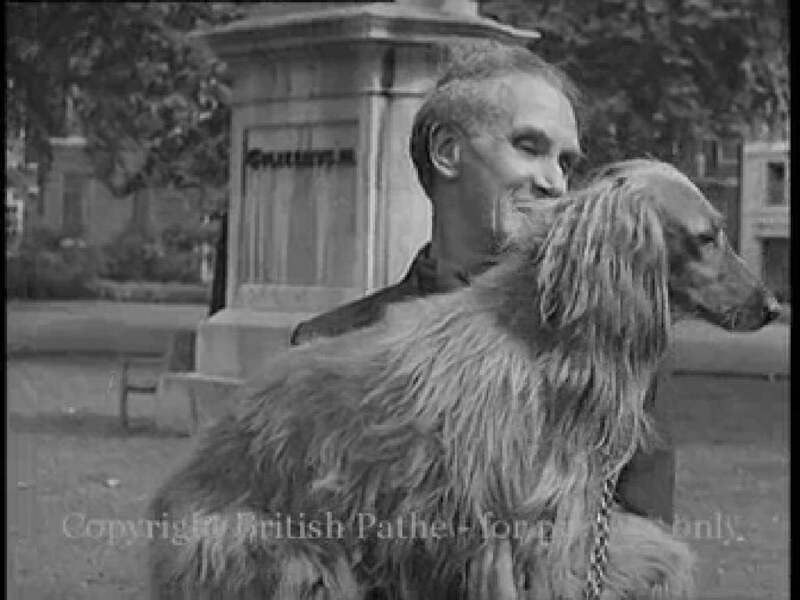 WESTMINSTER KC, NEW YORK, 1935 from "Portrait Of A Gentleman"
This clip provides us some with superb closeups of Ch Badshah Of Ainsdart. 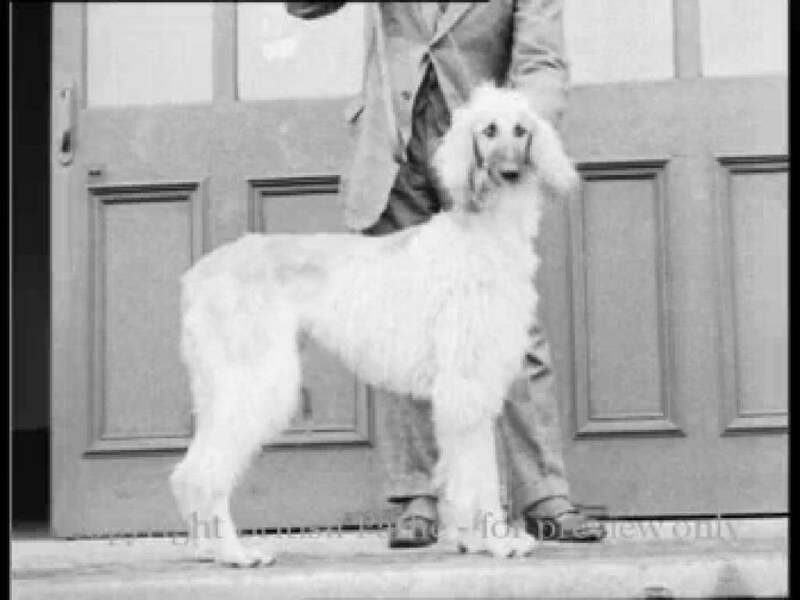 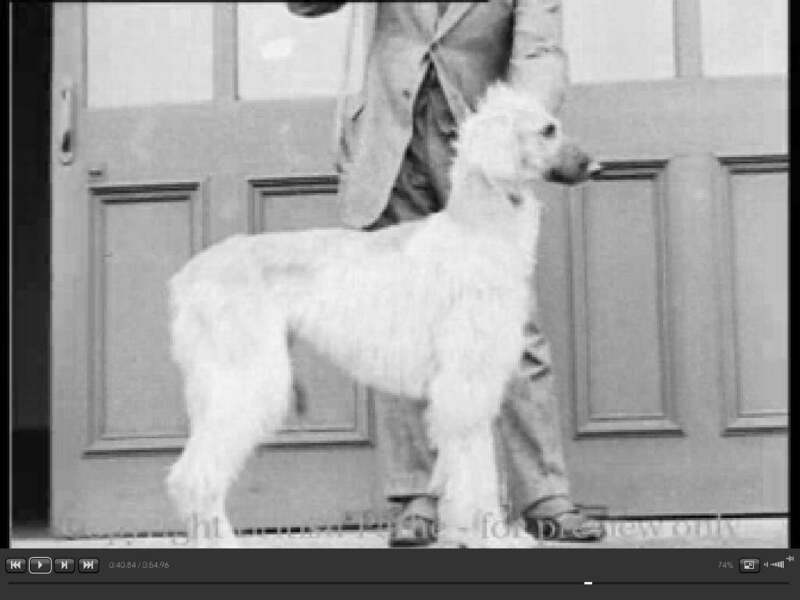 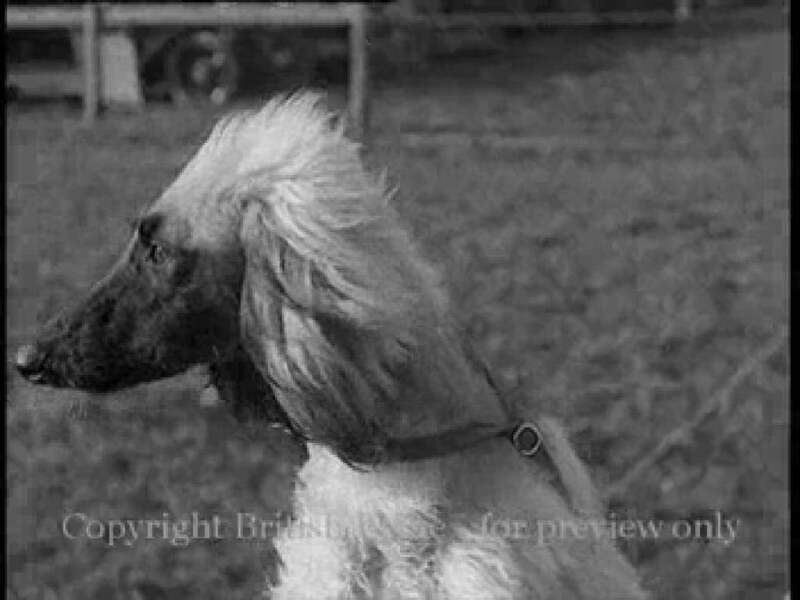 Badshah was exported to the Prides Hill kennels )Connecticut, MA, USA) of Q A Shaw Mckean in 1934, so this must have been Badshah's first appearance at Westminster? 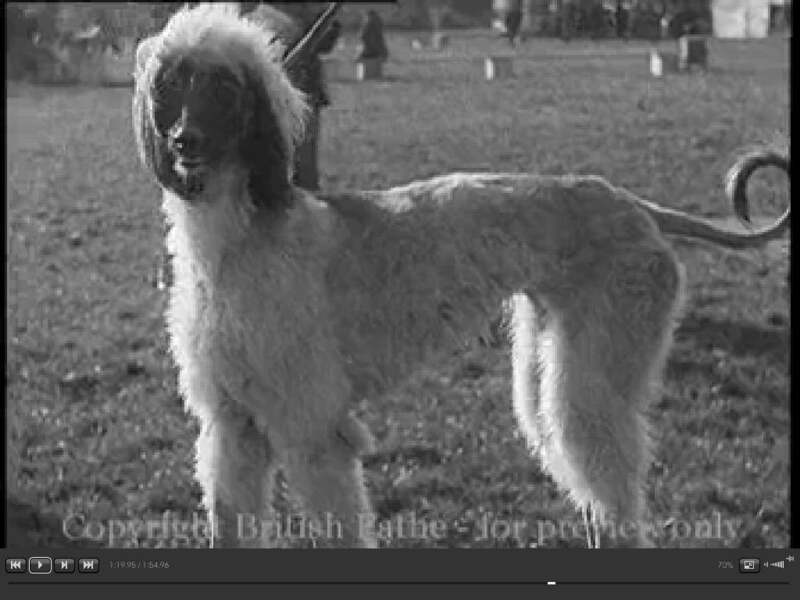 KENNEL CLUB SHOW 1923 from "Kennel club show"
CLONMEL, IRELAND, 1931 from "Clonmel Dog Show"
LONDON 1939 from "London 1939"
L/S's and M/S's of Sir Herbert Barker the famous bones setter with his dog (Afghan hound). 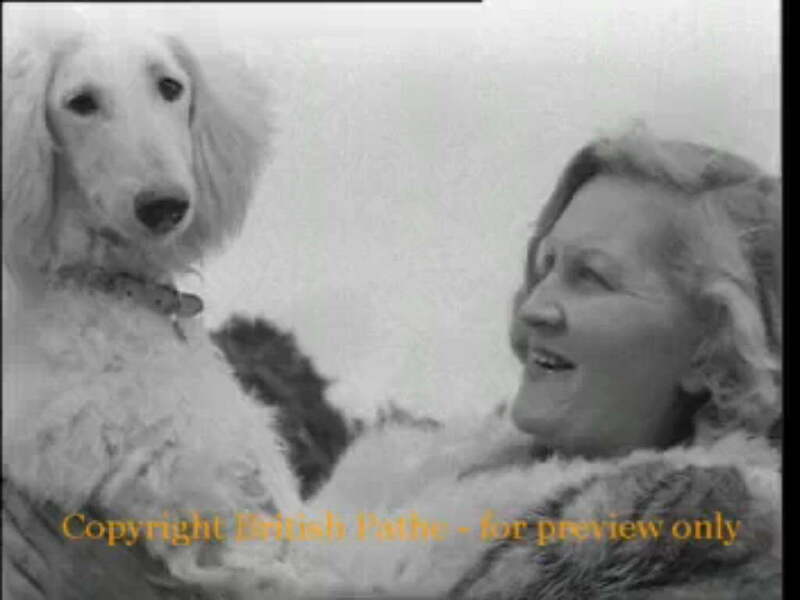 The commentator says that the controversial figure is to have a series of films made about him. 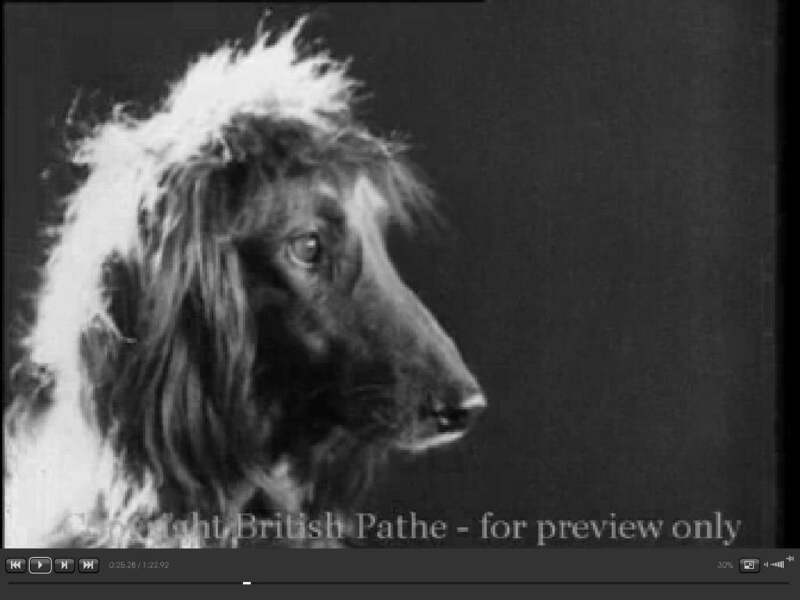 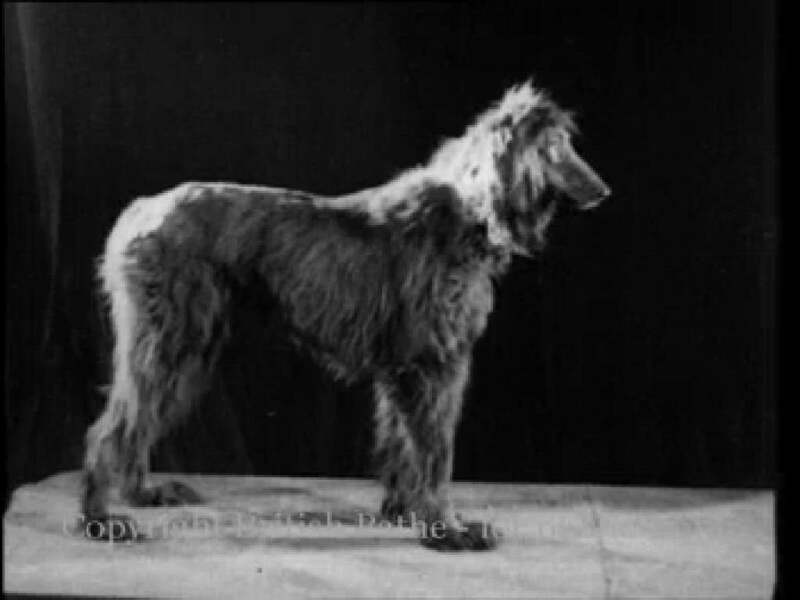 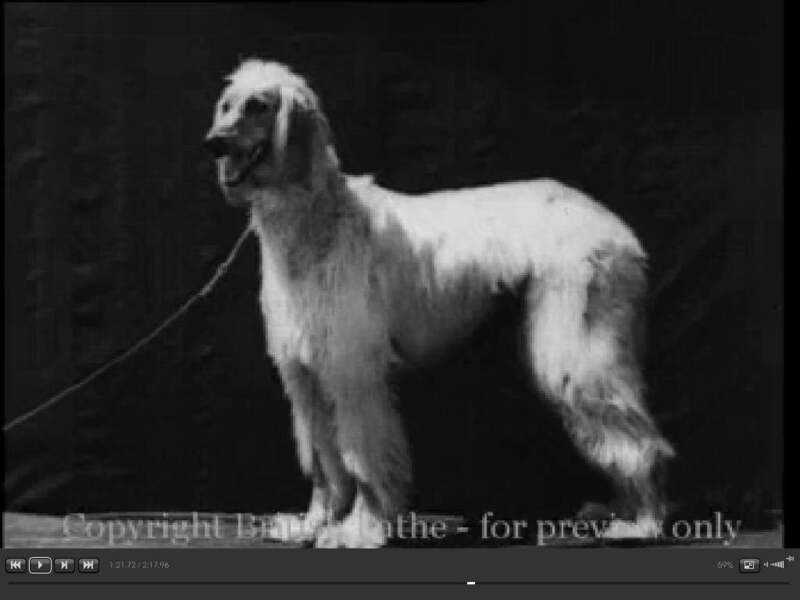 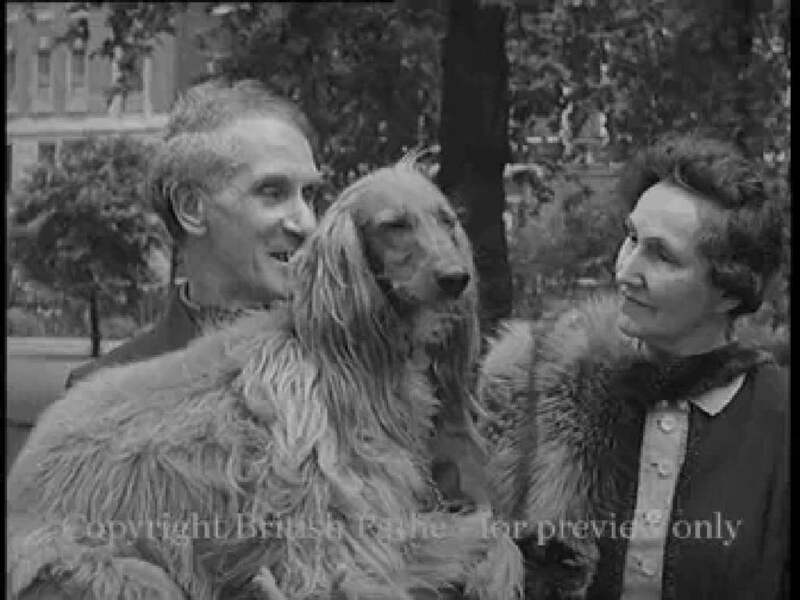 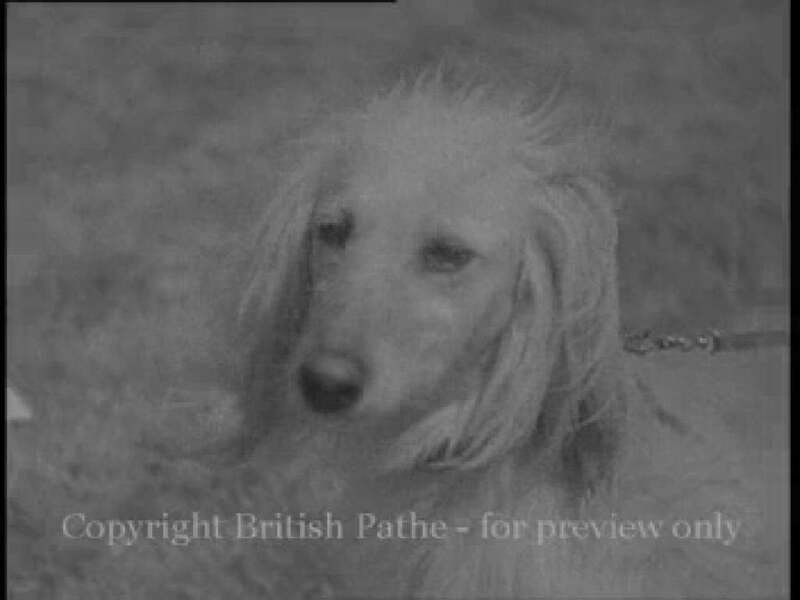 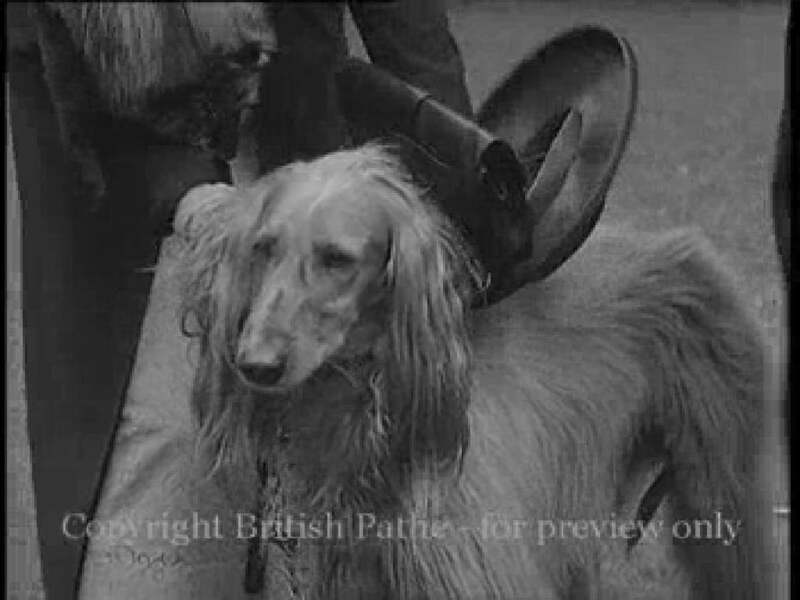 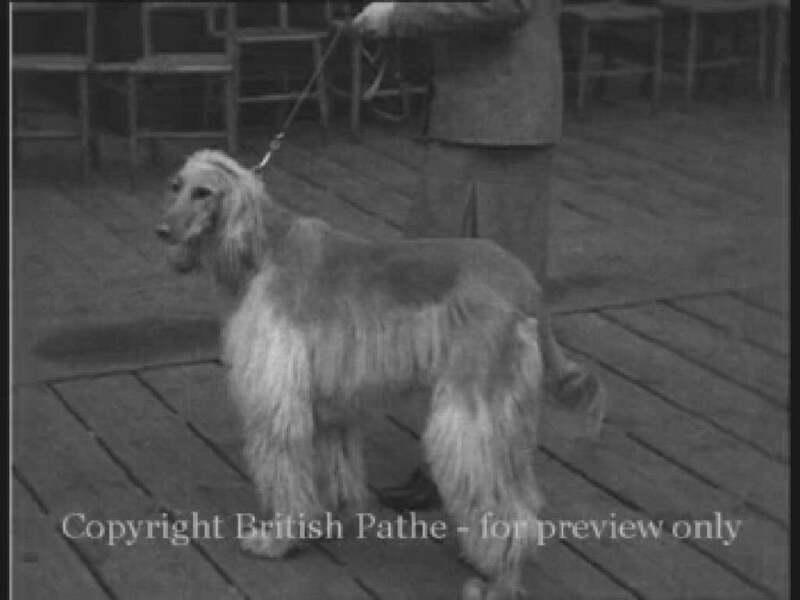 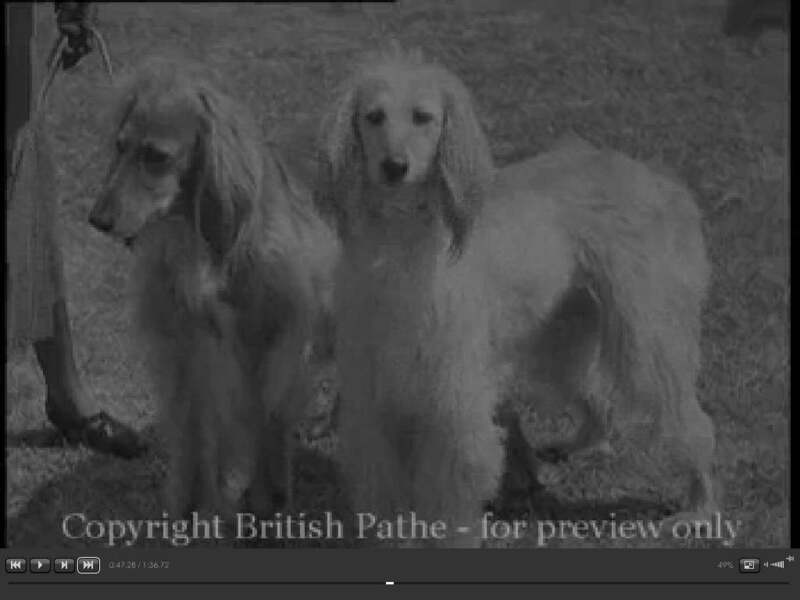 CRUFTS 1934 from "Doggy Days Are Here Again (and Leonard Henry Describes Them), just outside London 1935"
This clip was filmed at a place called "Skindles" which is on the River Thames about 30 miles west of London. 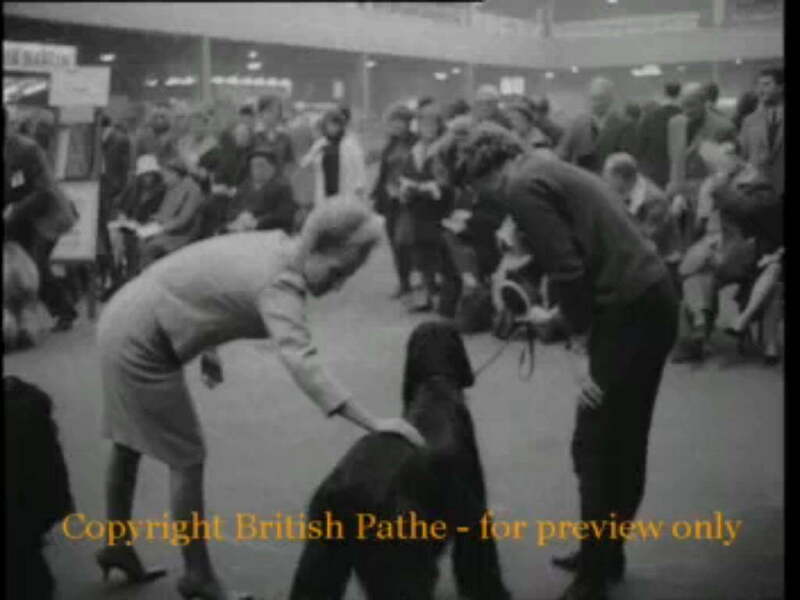 We have yet to track down the actual dog show and names of the hounds in the clip. 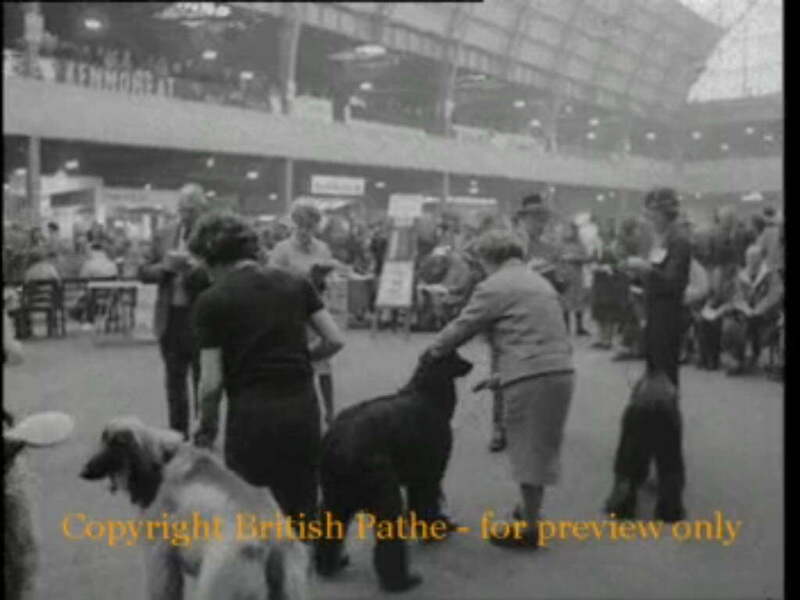 CRUFTS 1934 from "Pups Pets and their points" 1934-1935"
CRUFTS 1938 from "Pups Pets and their points" 1934-1935"
Now, this clip involves an amazing coincidence. 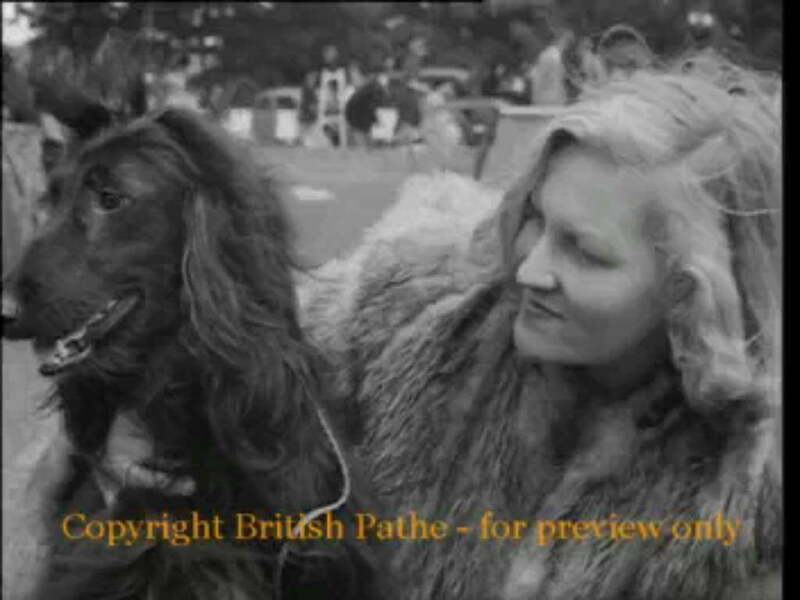 10 years ago! 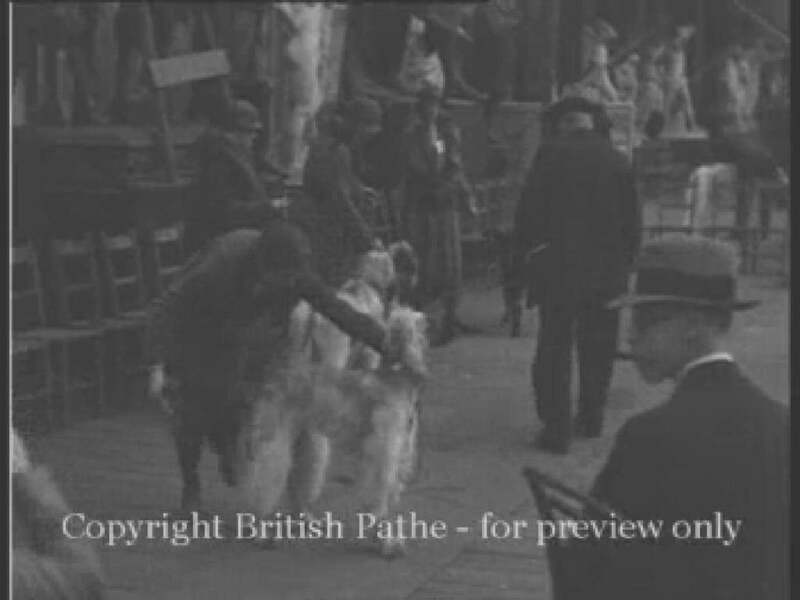 I purchased a "negative" taken from a newsreel clip. 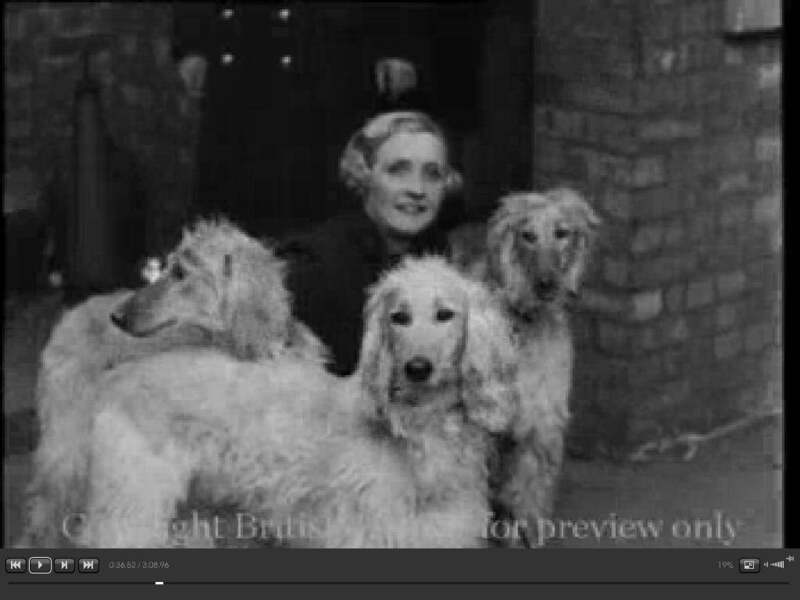 It now transpires that that "negative" came from this very newsreel clip. 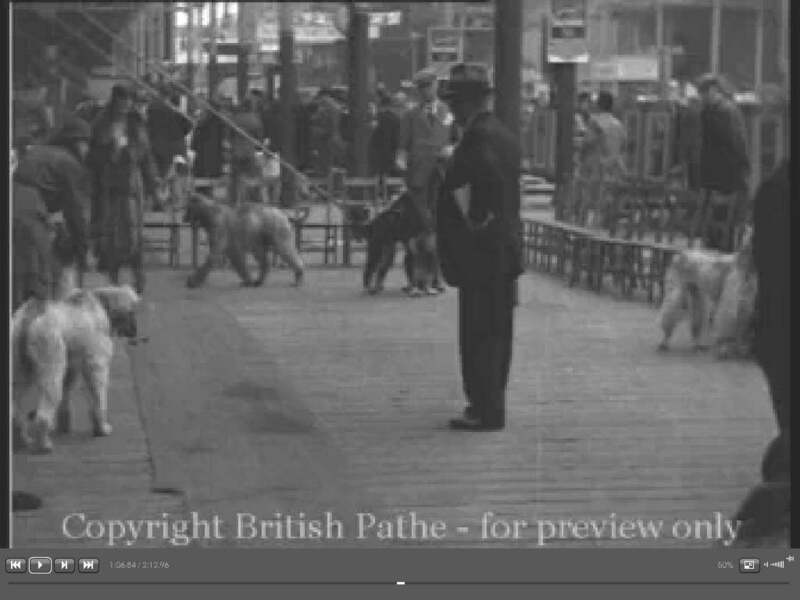 You can read the associated story here about researching that negative photo 10 years ago! 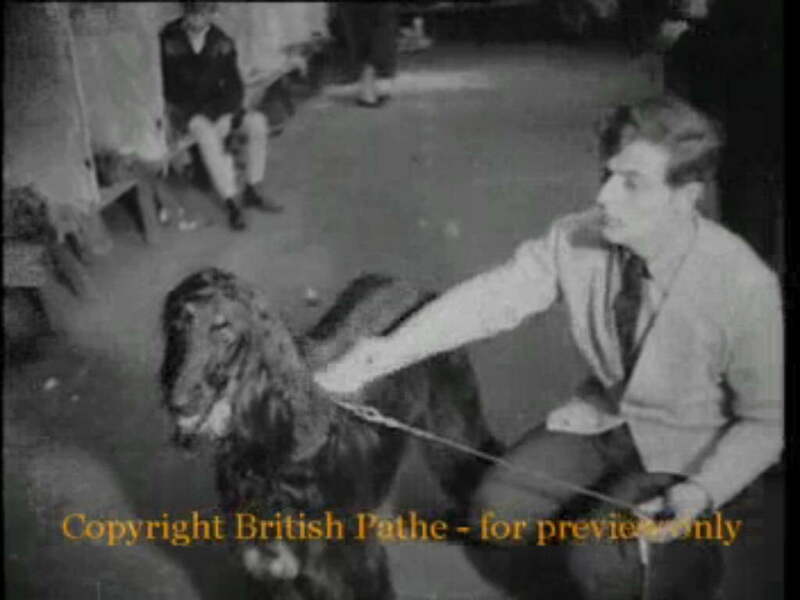 The Opening shot is Allan Brooks (Bondor) - there was a black Bondor dog - Bondor Othello - could be him. 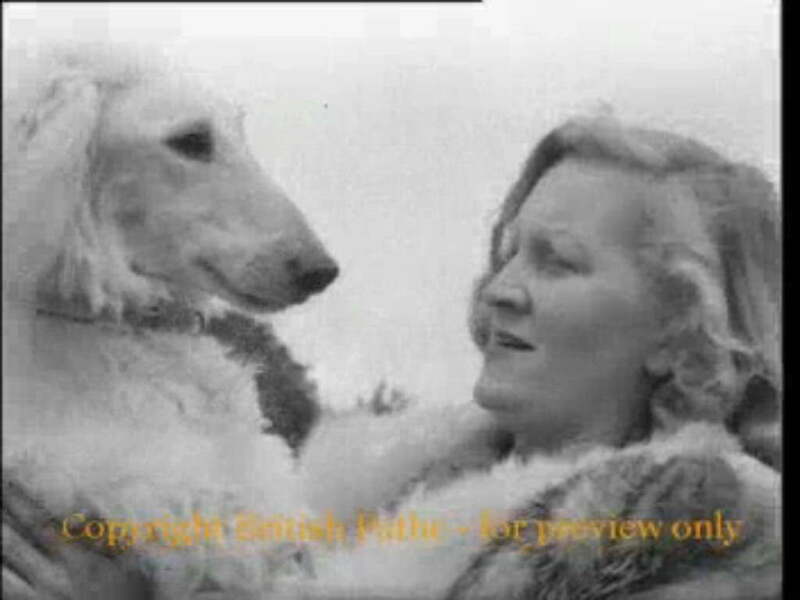 Marna Dods (Horningsea) was showing Mustagh Ata. 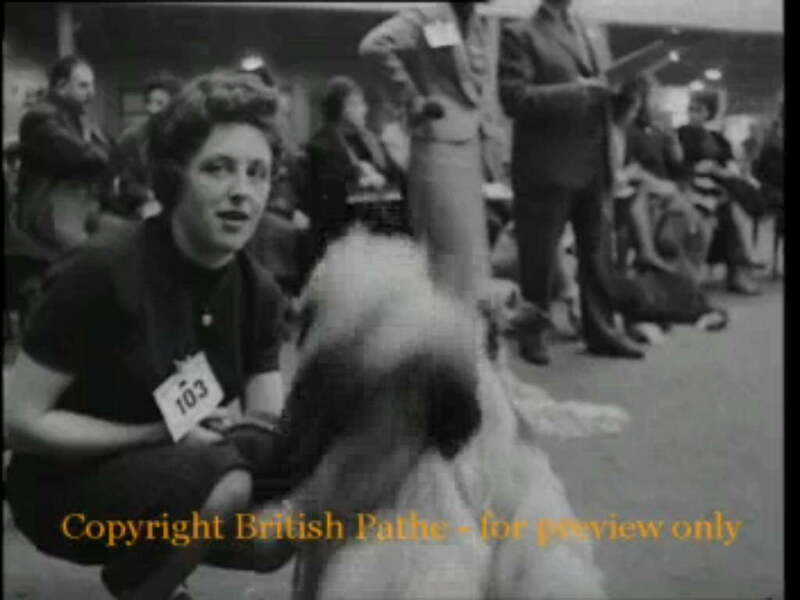 Ringside we saw Hazel Munro sitting beside Albert Munro. 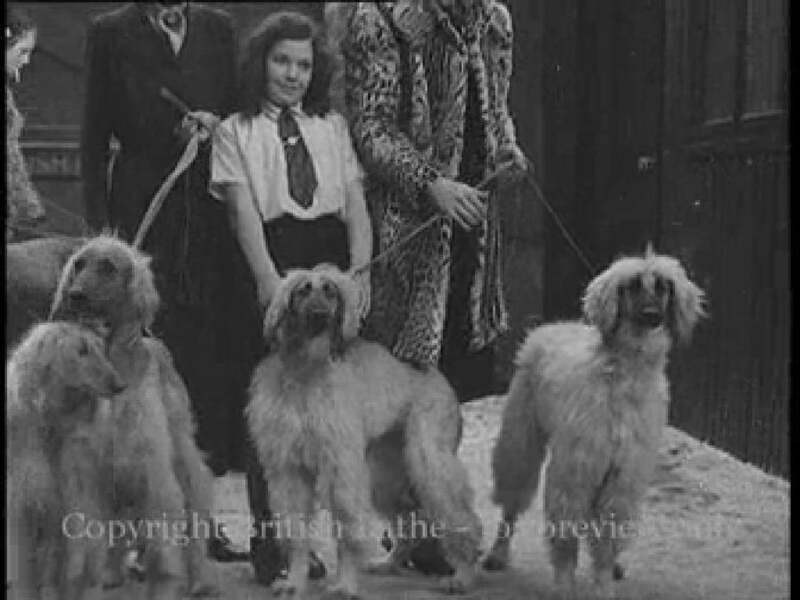 Dan James (Jahadi) standing behind the seated ringsiders.